President Trump and Japanese Prime Minister Shinzo Abe hold a joint news conference in the East Room of the White House on Friday. In welcoming Abe, Trump affirms U.S. commitment to defending Japan. Donald Trump said the alliance between the US and Japan was the “cornerstone of peace” in the Pacific, after meeting Japan’s Prime Minister Shinzo Abe. After talks at the White House, Mr Trump said the US was committed to “the security of Japan”. Echoing his words, Mr Abe also stressed on the importance of strengthening economic and trade relations. Mr Trump had previously taken issue with the US trade deficit with Japan, threatening tariffs on carmaker Toyota. 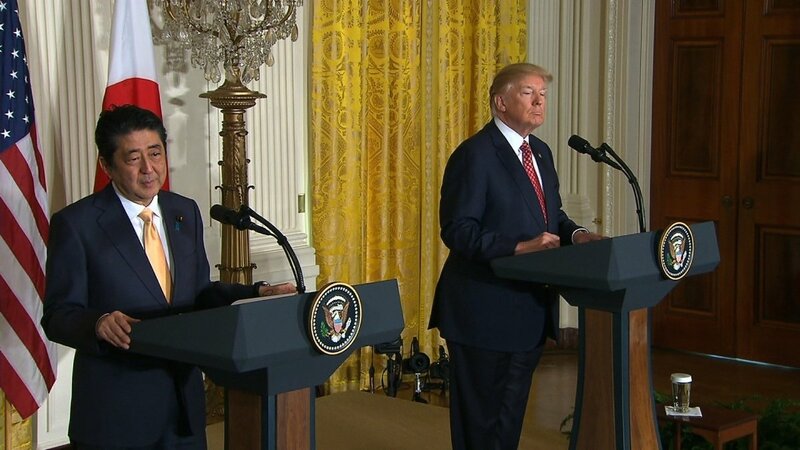 At a joint press-conference on Friday, President Trump described Japan as “an important and steadfast ally”, adding that Washington was committed to bringing bilateral ties even closer. He also said the two nations would continue to build up defensive capabilities in the Pacific, promoting shared interests – including freedom of navigation. The US army maintains a significant presence on the island of Okinawa and elsewhere in Japan, a key security lynchpin in the vast region. Japan is looking for guarantees of a US military commitment to maintain stability in the region, as China continues its ascent as a military superpower while North Korea develops its nuclear programme despite UN sanctions. A joint statement by Mr Trump and Mr Abe specifically mentioned that a bilateral security treaty covered the Senkaku Islands. The islands, in the East China Sea, are controlled by Japan, but are also claimed by China, which refers to them as Diaoyu Islands. China has been increasingly assertive in the area in recent years. Addressing trade ties, Mr Trump stressed that his administration would seek “free” and “fair” relations with Tokyo. Mr Abe agreed, but added that there needed to be dialogue to iron out differences on some key issues. He earlier expressed hopes that his visit to the US would “usher in a new era of our bilateral relations”. And he described US-Japanese trade ties as a “truly win-win relationship”. The two leaders are expected to discuss over the weekend Mr Trump’s decision to withdraw the US from the controversial 12-nation Trans-Pacific Partnership (TPP) trade pact, which Tokyo had lobbied hard for. Toyota responded saying production and employment levels in the US would not decrease. Mr Trump has also previously criticised Japan for not buying enough US-made cars, in comments reminiscent of the 1980s trade friction between the two economic powerhouses. He has also named Japan as one of several countries contributing to the US trade deficit, and accused it of currency manipulation. The Japanese government has in turn taken pains to point out that as a top US direct investor, Japan has created hundreds of thousands of US jobs, and that other countries such as China have far larger trade surpluses than Japan. Chief cabinet secretary Yoshihide Suga said last month it was “absolutely not the case” that Tokyo was devaluing the yen to benefit its exporters, and that it had embarked on monetary easing to stabilise prices domestically. Mr Trump will be hosting Mr Abe and his wife at his Mar-a-Lago Club in Florida, where the two leaders will play golf. They last met in November when Mr Abe visited Mr Trump in New York shortly after the latter won the US presidential election. Mr Abe is the second foreign leader Mr Trump has met since taking office, after Britain’s PM Theresa May.